The Royal Australian Mint has previewed (1st February) their upcoming series of collector coins that highlight a new feature of black nickel and selective gold-plated coins. The series was previewed during the media forum at this year’s World Money Fair in Berlin where the Royal Australian Mint announced a new series entitled “Echoes of Australian Fauna,” which features native Australian animals from the past and present. The black nickel plate, which features on the surface of the coins, accentuates the mysterious and primordial nature of the landscape, while the selective gold-plating, alternating with the black nickel, provides a beautiful contrast showcasing these unique and elusive creatures. 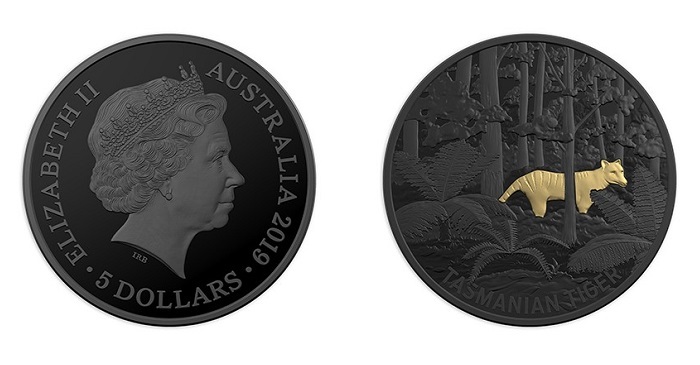 The limited production series will feature three 2019 $5 nickel-plated and selectively gold-plated fine silver Proof coins and the reverse of each coin will feature the artwork of a different Australian animal, including the extinct Tasmanian tiger, the extinct lesser bilby, and the night parrot. The obverse of each coin in the series will feature the effigy of H M Queen Elizabeth II, as sculpted by Ian Rank-Broadley. Coin 1: Benjamin, the last known Tasmanian tiger, died on the 7th September 1936, at Hobart Zoo. Benjamin spent several years behind bars in the Hobart Zoo after being caught in the Florentine Valley in 1933. Although there had been a conservation movement for the protection of the animal since 1901, official protection of the species by the Tasmanian government was introduced in July 1936. Unfortunately, this was just 60 days before Benjamin, the last known Tasmanian Tiger, died in captivity. Surviving evidence suggests that the tiger was a relatively shy, nocturnal creature with the general appearance of a medium-to-large-size dog, except for its stiff tail and abdominal pouch, similar to that of a kangaroo. Coin 3: The night parrot is a small ground-dwelling nocturnal parrot only found in Australia. Until very recently, it was thought to be extinct, with no confirmed sighting of it for over a hundred years. It is well known as being one of the most elusive and mysterious birds in the world and is nocturnal in its feeding behaviour and movements. It is reasonable to assume, based on the tracking of individual birds, that some night parrots may fly 100 kilometres or more in a night between roosting, foraging, and drinking locations. 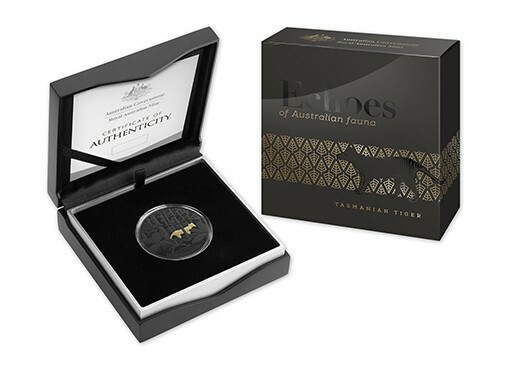 Each coin is encapsulated and presented in a branded Royal Australian Mint case, accompanied by a numbered certificate of authenticity. The Tasmanian tiger coin will be the first of the series available for purchase on the 4th March, while the lesser bilby coin will be available on the 6th May, and the night parrot will be available on the 1st July. For additional information about these coins and others available from the Royal Australian Mint, please visit their website. It is advisable to place orders early as the demand for this series is expected to be greater than their mintage.